What an ambitious project! This tome is not the kind of thing any writer puts together for money. It’s a labor of painstaking love and pride. Years were spent assembling Napoleon’s military ideas. Thank you once and thank you twice, to Oxford University Press and Net Galley for allowing me to preview the DRC. And of course, thank you to Mr. Colson for his effort. You can buy it this month. The difficulty in publishing Napoleon’s ideas is that they were scattered. The man was not only a military genius but also an academic one, and every time he turned around he was having someone take something down. Assembling them into one place was another matter, particularly since he was captured, exiled, captured again, exiled again. In a fit of despondency he tossed the memoir he had begun into the flames at one point. So gathering everything together and then sorting the philosophical, which still has relevancy, from the technological part of Napoleon’s military work that is now outdated by more sophisticated weaponry, is another massive task. It’s no small wonder it took someone a long time to do the job and do it right. The reader will perhaps be surprised to learn how many quotations have been ascribed to Napoleon that he actually never said. That said, I also have to acknowledge that the niche audience here is academic. This is nobody’s breezy popular biography. And whereas I could happily never see some media jerk throw together something and pretend it’s accurate based upon his own personal fame, at the same time, I just need to warn the reader that this is going to be tough going. I’m persistent; I love history. I was willing to wade through Neil Sheehan’s Pentagon Papers, and I was willing to fight my way through this book too. But for most readers, either a purpose, such as perhaps upper level or graduate level university course work or a thesis, or a really intense interest in French history and military strategy will be required to get through it. Colson’s scholarship and research are beyond reproach. Read the introduction and you’ll get the point. He has done his homework many times over. In fact, unless one is a fluent reader of French, it would be impossible to duplicate his effort even if one were inclined to try. But why do that, when you can access this excellently researched and painstakingly organized volume? Highly recommended for the serious scholar. 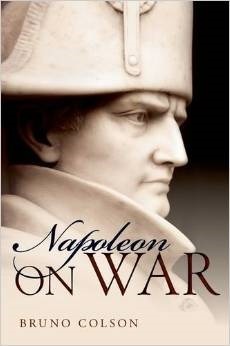 This entry was posted in biography, history and tagged biography, book blog, European history, French history, military history, military strategy, Napoleon, Napoleon: On War review by seattlebookmama. Bookmark the permalink.